Sublime Text is a source code editor. Sublime Text is non-free, non-open source and cross-platform (Mac, Windows and Linux). This review is based on features I require of an advanced text editor. A list of required features was created after using different editors. Some features require extensions or plug-ins. 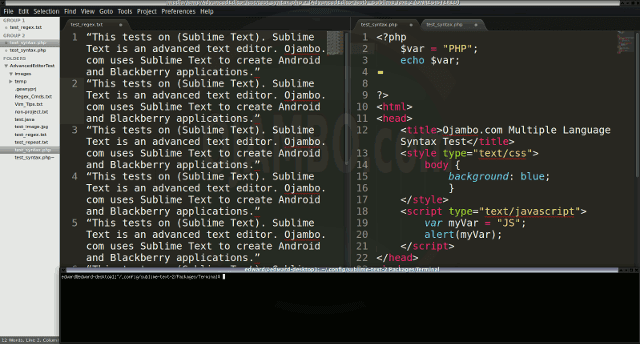 Sublime Text is a free text editor from http://www.sublimetext.com. There are downloadable packages for Linux, Mac and Windows systems. Sublime Text can easily be extended by plug-ins to ease application development in different programming languages. CPU: Intel(R) i7 2600 @ 3.40GHz. Operating System: Debian Jessie Testing 64bit. Desktop: Xfce Desktop Environment 4.10. Large file: 1GB human-readable text. Regex file: text with word “Sublime Text” repeated. Media file: Smiley face JPEG file. Three bias elimination steps were utilized. The editor was used for at least three years on different platforms. Attempts were made to get stable plug-ins for missing features. The same editor was compared between the one in the repository, the developers website, and the compiled version if applicable. Sublime Text was installed from the Debian repository. Sublime Text and its plug-ins do require GTK2 and Python runtime dependencies. Sublime Text does not need re-installation every time I change my distribution because it is built from source. Sublime Text was installed on a separate partition that is immediately available for other installed Linux distributions. All plug-ins were installed once and never require re-installation. The theme can be native for the editor in terms of the background. Sublime Text dark and light themes can be created or downloaded. The score for the theme was a perfect 1.0. Dragging and dropping a text file into the editor opens a new tab. It is not possible to specify the tab location during the drag and drop operation. The score for drag and drop into editor was 0.5. Opening a very large text file did not crash Sublime Text. Sublime Text was able to edit the large file. The score for opening a large file was 1.0. Multiple documents can opened in multiple tabs. Tear-off tabs work by opening in new window as a new instance which is handy for multiple monitors. The score for multiple documents was 1.0. Multiple editors can be opened as new tabs with drag options. The window view can be split either vertically or horizontally but Sublime Text does not have a multiple editor view. The score for multiple editor view was 0.5. Creating non-project files is possible. Non-project files can be opened by the drag and drop operation. The score for creating non-project files was a perfect 1.0. Soft word wrap can be enabled on all documents as word wrap. Automatic soft wrap for documents is available from the Sublime Text settings. The score for word wrap was a perfect 1.0. Spell check works as words are typed. Spelling errors are shown in opened documents. The score for spell check was a perfect 1.0. Word count is available for Sublime Text using the Real Time Word Counter plugin. Selection word count is available as part of word count. The score for word count was a perfect 1.0. Go to line can jump to a specified line. It is possible to jump to either the first or last line. The score for go to line is a perfect 1.0. Indentation can default to user-defined tab stops. Children are automatically indented. The score for indentation was a perfect 1.0. Fonts can be dynamically scaled. The system font can be bypassed and a new editor font and size can be set. The score for fonts was a perfect 1.0. Find and replace using regular expressions can be utilized for all open documents in the current session. Find and replace will work for the current document or a selection in the current document. The score for find and replacing using regular expressions was a perfect 1.0. Multiple language syntax highlighting in one file is enabled if the language plug-ins are installed. Each language has code-sensitive syntax colours which can be modified. The score for multiple language syntax highlighting was a perfect 1.0. Code folding does not work for markup languages such as HTML. Code folding also does not work for programming languages such as Java. The score for code folding was 0.0. Selecting rectangular block per column works. Rectangular block selection works with word wrap enabled. The score for selecting rectangular block was a perfect 1.0. Multiple selection is available for Sublime Text. Search multiple selection is available. The score for multiple selection was 1.0. Distraction-free mode to hide panes works. Line numbers can be toggled to improve distraction-free mode. The score for distraction-free was a perfect 1.0. The file manager can to create and delete folders. Media files cannot be dragged and dropped into the file manager pane. The score for file manager was 0.5. Terminal requires the non-embedded Terminal plugin. The terminal does follow folder if enabled. Terminal can execute system commands. The score for terminal was a perfect 1.0. Sublime Text is a very powerful text editor. By default, the Sublime Text editor is missing required features which can be installed by using extensions. For my required features, the Sublime Text editor scored 87.5% or 8.75 out of 10. Sublime Text is a very powerful text editor. Basic editor features are missing in Sublime Text. Important editor features require Sublime Text plug-ins. Overall Sublime Text only scored 8.75 out of 10 for essential text editor features. 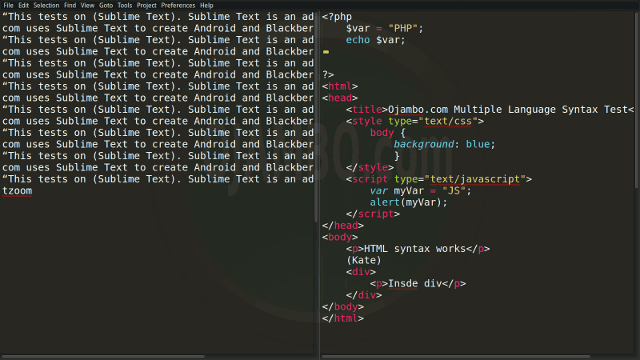 Sublime Text is able to use the system native theme and fonts. Sublime Text has one of the best multiple selections available for any editor. The find and replace feature for Sublime Text can use all open documents in the current session. Look for required plug-ins before deciding to try Sublime Text. Download desired Sublime Text editor themes. Install Sublime Text from developer’s website. 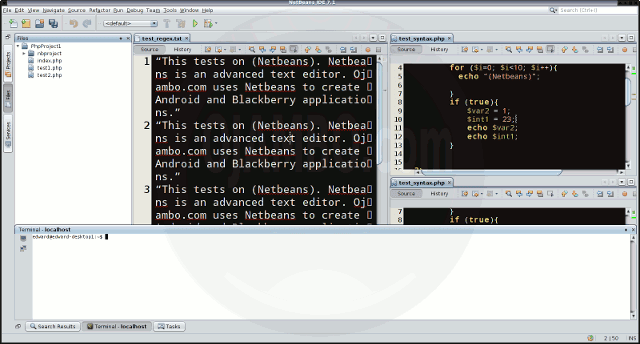 Netbeans is a Java-based integrated programming environment (IDE). Netbeans is free, open source and cross-platform (Mac, Windows and Linux). Netbeans is a free IDE for Java from https://netbeans.org. There are downloadable packages for Linux, Mac and Windows systems. 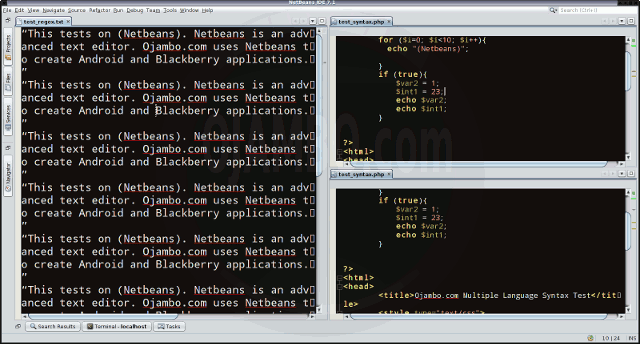 Netbeans can easily be extended by plug-ins to develop applications in other programming languages. Regex file: text with word “Netbeans” repeated. Netbeans was downloaded from the developer’s website for portability. Netbeans and its plug-ins are bloated. I did not wish to reinstall Netbeans every time I changed my distribution. Netbeans was installed on a separate partition that is immediately available for other installed Linux distributions. All plug-ins such as PHP and Git were installed once and never require re-installation. The theme cannot be native for the editor in terms of the background. Netbeans dark and light themes can be created or downloaded. The score for the theme was 0.5. Opening a very large text file did not crash Netbeans. An out of memory window was shown and it was not possible to edit the large file. The score for opening a large file was 0.5. Multiple documents can opened in multiple tabs. Tear-off tabs work by opening a new Netbeans editor instances which is handy for multiple monitors. The score for multiple documents was a perfect 1.0. Multiple editors can be opened as new tabs with drag options. Every new editor tab can be split vertically or horizontally. The score for multiple editor view was a perfect 1.0. Creating non-project files is impossible. Non-project files can be opened by the drag and drop operation. The score for creating non-project files was 0.5. Soft word wrap can be enabled in the editor settings. Automatic soft wrap for documents is available for Netbeans. The score for word wrap was a perfect 1.0. Word count is not available for Netbeans. Selection word count is not available. The score for word count was 0.0. Go to line can jump to a specified line. It is possible to jump to either the first or last line. The score for go to line was a perfect 1.0. Find and replace using regular expressions cannot be utilized for all open documents in the current session. Find and replace will work for the current document or a selection in the current document. The score for find and replacing using regular expressions was 0.5. Code folding works for markup languages such as HTML. Code folding does not work for programming languages such as Java. The score for code folding was 0.5. Selecting rectangular block per column works. Rectangular block selections work with word wrap enabled. The score for selecting rectangular block was a perfect 1.0. Multiple selection is not available for Netbeans. Search multiple selection is not available. The score for multiple selection was 0.0. The file manager can create and delete folders. Media files can be dragged and dropped into the file manager pane. The score for file manager was a perfect 1.0. Terminal is integrated into Netbeans. The terminal does not follow folder. Terminal can execute system commands. The score for terminal was 0.5. Netbeans is a very powerful IDE. By default, the Netbeans editor is missing required features which can be installed by using extensions. For my required features, the Netbeans editor scored 72.5% or 7.25 out of 10. Netbeans is a very powerful integrated programming environment. Basic editor features are missing in Netbeans. Important editor features require Netbeans plug-ins. Overall Netbeans only scored 7.25 out of 10 for essential text editor features. Netbeans uses and renders non-native theme and fonts. Netbeans has one of the best multiple language spell checkers available for any editor. The dynamic font zoom is one of the easiest to use of any editor. Look for required plug-ins before deciding to try Netbeans. Download Netbeans from the developer’s website. Install Netbeans in a permanent location. 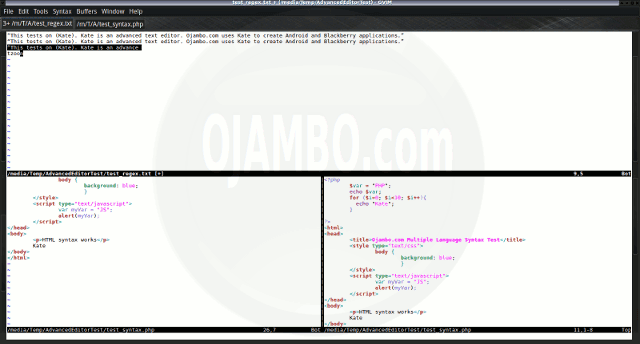 A Video for the Ojambo.com GVim Advanced Editor Review article. GVim is a lightweight Integrated Development Environment. GVim is free, open source and cross-platform (Mac, Windows and Linux). GVim is a free text editor from http://www.vim.org. There are downloadable packages for Linux, Mac and Windows systems. GVim can easily be extended by plug-ins to ease application development in different programming languages. Regex file: text with word “GVim” repeated. GVim was installed from the Debian repository. GVim and its plug-ins do require GTK2 runtime dependencies. GVim needs re-installation every time I change my distribution unless built from source. GVim was installed in the system folder and was never available for other installed Linux distributions. All plug-ins also require re-installation. The theme can be native for the editor in terms of the background. GVim dark and light themes can be created or downloaded. The score for the theme was a perfect 1.0. Dragging and dropping a text file into the editor opens a new tab or buffer. It is possible to specify the tab location during the drag and drop operation. The score for drag and drop into editor was a perfect 1.0. Opening a very large text file did not crash GVim. GVim was able to edit the large file. The score for opening a large file was a perfect 1.0. Multiple documents can opened in multiple tabs or buffers. Tear-off tabs do not work but GVim has a feature to open in new window as a new instance which is handy for multiple monitors. The score for multiple documents was 0.5. Multiple editors can be opened as new tabs with drag options. Each tab window view can be split either vertically or horizontally as a multiple editor view. The score for multiple editor view was 0.5. Soft word wrap can be enabled on all documents as line wrapping. Automatic soft wrap for documents is available from the GVim settings. The score for word wrap was a perfect 1.0. Word count is available for GVim. Selection word count is available as part of word count. The score for word count was a perfect 1.0. Fonts can be not dynamically scaled with the footzoom plugin by thinca. The system font can be bypassed and a new editor font and size can be set. The score for fonts was 0.5. Code folding works for markup languages such as HTML. Code folding also works for programming languages such as Java. The score for code folding was a perfect 1.0. Multiple selection is available for GVim using the multiselect plugin by Hari Krishna Dara. Search multiple selection is not available. The score for multiple selection was 0.5. The file manager required the File system browser plug-in to create and delete folders. Media files cannot be dragged and dropped into the file manager pane. The score for file manager was 0.5. Terminal does not require a plugin. The terminal does not follow folder. Terminal can execute system commands. The score for terminal was 0.5. GVim is a very powerful text editor. By default, the GVim editor is missing required features which can be installed by using extensions. For my required features, the GVim editor scored 85.0% or 8.50 out of 10. GVim is a very powerful text editor. Basic editor features are missing in GVim. Important editor features require GVim plug-ins. Overall GVim only scored 8.50 out of 10 for essential text editor features. GVim is able to use the system native theme and fonts. GVim has one of the best find and replace regular expressions available for any editor. Large files can be opened quickly in GVim. Look for required plug-ins before deciding to try GVim. 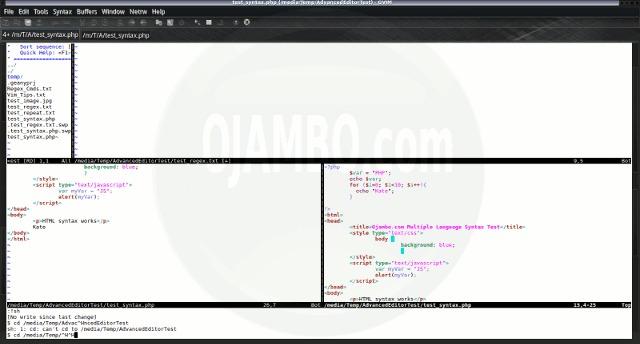 Download desired GVim editor themes. Install GVim from your distribution repository if applicable.